Usually one can only see a small golden statue in the main hall, which has been placed in front of the “real” deity. This is called maebutsu (前仏) or “Buddhist image in front.” Also “hidden” is a staff given to Kōbō Daishi in China from Huiko (Keika) (746-805), the seventh Patriarch of Esoteric Buddhism. This, like the statue of Yakushi Nyorai, is only on public display during special viewing events. Gradually the temple prospered and grew and it is said that there were more than 100 buildings. But then during the 16th century all of the buildings, except for one hall, were burned down by the troops of Chōsokabe Motochika (長宗我部元親). 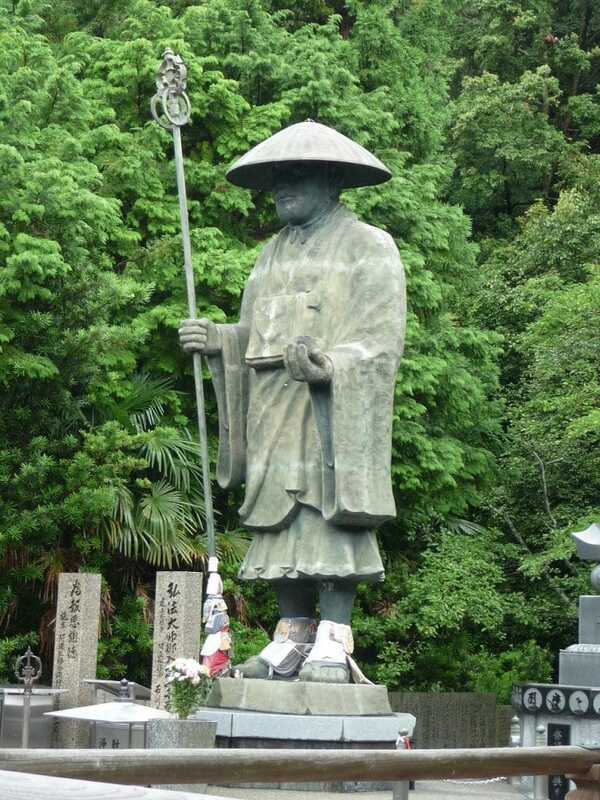 Fortunately, the statue of Yakushi Nyorai and the staff were not destroyed. Later, during the 17th century, the lord of Takamatsu, Matsudaira Yorishige (松平頼重) donated land and the temple was rebuilt. However, the temple was again destroyed by fire in 1900 and sometime afterwards, the temple buildings were rebuilt. The Daishidō was reconstructed in 1984. On one side of the Daishidō is a large statue of Kōbō Daishi that was donated in 1990 and on the other side you can see a lot of staffs enclosed in a glass structure. Many people who finish their pilgrimage here want to present their staff to the temple, but the temple staff would like you to take the staff home as a memoir of your trip or present it to someone. However, if you want to leave it at the temple you must pay 1000 yen. All of the collected staffs are burned in a fire ceremony held a couple of times a year. Inside the Daishidō on the main floor are numerous colour paintings depicting events in the life of Kōbō Daishi and in the basement there is a “stand on sand” (osunafumi: お砂踏み) eighty-eight pilgrimage route. Small statues of the main deities of each temple are placed about a foot apart and in front of them beneath the floor is sand that has been collected from all eighty-eight sacred sites. If you wish to enter the Daishidō and see this mini-pilgrimage etc., you must ask at the temple office and pay the 500 yen fee. Hours 9am~4:30 pm. 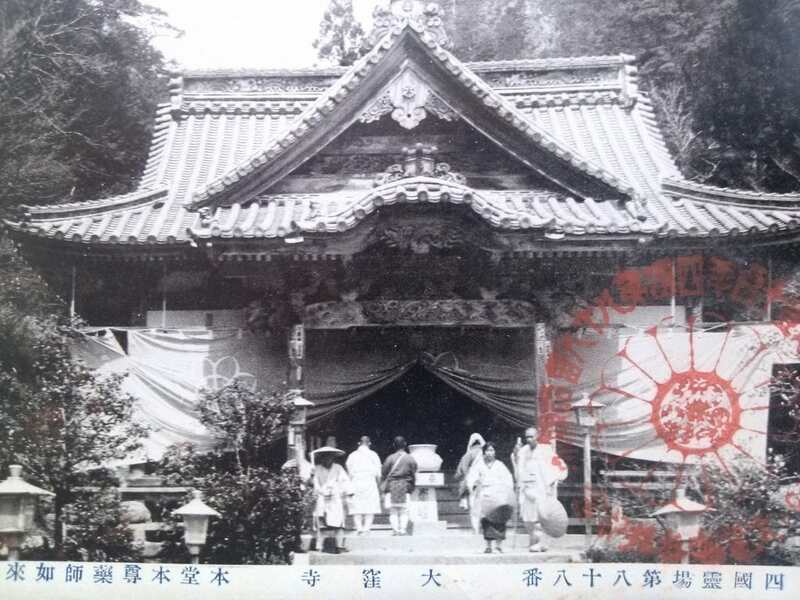 There is an interesting tale related to Ōkubo-ji from about two hundred years ago. In the fall of 1817, there were two pilgrims from the southern part of Hyogo prefecture, who had left home to become Buddhist priests. They were chanting Nembutsu in front of the statue of the main deity, Yakushi Nyorai, but one of them became totally paralyzed and was unable to freely move his arms and legs. The other one saw and said blaming him, “What have you done wrong? Please be honest and confess.” The other replied, “I don’t remember doing anything bad”, but added, “Wait a minute. I have offered my fuda up to this point, but I have received this punishment because I have sinned.” Then when he checked the contents of his bag, he found the chopsticks that belonged to the other fellow. The one who became paralyzed said, “All of a sudden I just wanted to have those chopsticks and I put them in my bag.” He repented and felt embarrassed for his mistake. After this when he expressed his remorse to the main deity with his travel companion his body was freed from its frozen state. From this temple, he went in reverse order while his companion continued onward with his pilgrimage. Not only the resident priest but also those that heard this story thought it was very strange. For those who are walking there are a few routes (see the route guide) from the Ohenro Koryu Salon to Ōkubo-ji, but if you want to stay away from traffic I recommend taking the path that goes up and over Mt. Nyotai (774m). If it is a clear day, the view from the summit is amazing, but the descent down to the temple is all stairs and can be hard on the knees. This article was first published in the June 2015 issue of Awa Life.